Zen Studios has released Williams Pinball Volume 1, bringing four classic '90s pinball machines to their excellent simulator Pinball FX 3. The first pack features Fish Tales, Junk Yard, The Getaway and one of the most popular machines of all time, Medieval Madness. The pack costs around $8, although Fish Tales is free-for-all Pinball FX 3 owners. 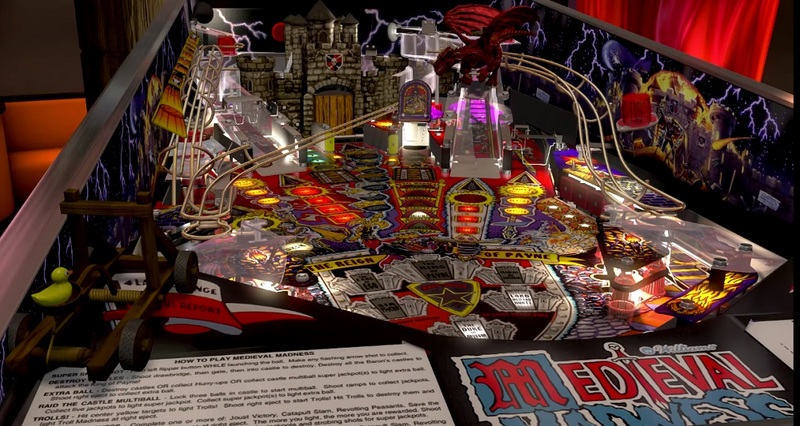 Each table has been painstakingly recreated in the Pinball FX 3 engine, and even features optional new special effects, adding tabletop characters and bringing some of the game's ornaments to life with new animations. The Bally/Williams licence and Zen Studios are truly a match made in heaven. Unfortunately, in order to secure an "E" rating, Zen have chosen to make alterations to the games' backglass, playfield and cabinet art, as well as some changes to Dot Matrix animations. All reference to tobacco and alcohol (such as cans of beer or a troll smoking a cigar) have been removed from the artwork and bloody weapons have been scrubbed cleaned. Mild innuendo also felt the airbrush, as Fish Tales' mermaids have had their midriffs covered, and a bikini-clad girl in Medieval Madness is now rocking a suit of armour. "In order to meet our age range obligations," reads an in-game message. "We were compelled to tone down or adjust the following pertinent contents of the table." This is followed by a list of changes made to Medieval Madness, Fish Tales and Junk Yard, examples of which you can read in the gallery below. Considering these tables have been released prior in their uncensored form - in titles such as The Pinball Arcade and Williams' Pinball Classics - this is disappointing. Censorship is an enemy of preservation, and whilst it's understandable why Zen Studios has chosen this option, I think they're doing themselves, and these games, an unnecessary disservice. For whatever it's worth, all four tables look fantastic and play great, as is to be expected from the highly-talented Zen Pinball crew. None of these small changes affect gameplay, they're purely egregious from an aesthetic standpoint. But to be dodging mild risque images for the sake of not getting a "T" rating (and in theory, as Williams Pinball Classics got away with "E10") raises questions about possible future titles such as Elvira: Scared Stiff, Frankenstein, Phantom of the Opera, Tales of the Arabian Nights, Xenon, Bram Stoker's Dracula, and other games that feature mild violence, booze, sexuality and gambling content. Williams Pinball Volume 1 is available now for Pinball FX 3 on PS4, PC, Xbox One and Nintendo Switch.